Here at The Freaky we love to celebrate the diversity of human beings so we applaud this inspiring message from a bearded Sikh girl to mocking online comments. 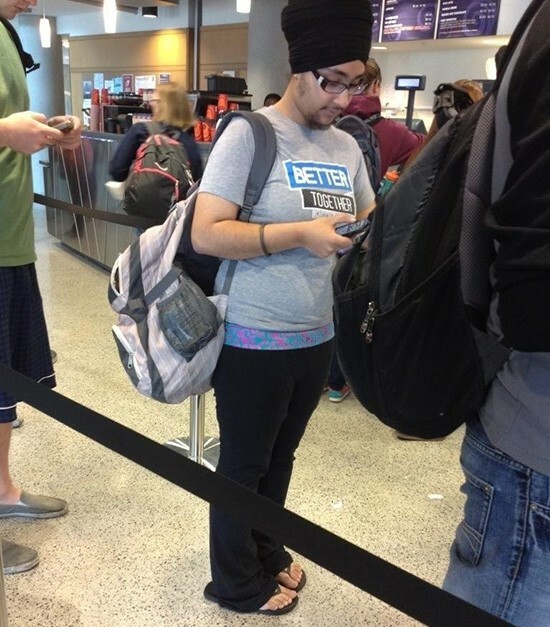 When this photo was taken of young Sikh student Balpreet Kaur at an airport, and posted on Reddit, it attracted hundreds of abusive comments, so Kaur joined Reddit and posted this inspiring and eloquent riposte. Hey, guys. This is Balpreet Kaur, the girl from the picture. I actually didn’t know about this until one of my friends told on facebook. If the OP wanted a picture, they could have just asked and I could have smiled 🙂 However, I’m not embarrased or even humiliated by the attention [negative and positve] that this picture is getting because, it’s who I am. Yes, I’m a baptized Sikh woman with facial hair. Yes, I realize that my gender is often confused and I look different than most women. However, baptized Sikhs believe in the sacredness of this body – it is a gift that has been given to us by the Divine Being [which is genderless, actually] and, must keep it intact as a submission to the divine will. Just as a child doesn’t reject the gift of his/her parents, Sikhs do not reject the body that has been given to us. By crying ‘mine, mine’ and changing this body-tool, we are essentially living in ego and creating a seperateness between ourselves and the divinity within us. By transcending societal views of beauty, I believe that I can focus more on my actions. My attitude and thoughts and actions have more value in them than my body because I recognize that this body is just going to become ash in the end, so why fuss about it? When I die, no one is going to remember what I looked like, heck, my kids will forget my voice, and slowly, all physical memory will fade away. However, my impact and legacy will remain: and, by not focusing on the physical beauty, I have time to cultivate those inner virtues and hopefully, focus my life on creating change and progress for this world in any way I can. So, to me, my face isn’t important but the smile and the happiness that lie behind the face are. 🙂 So, if anyone sees me at OSU, please come up and say hello. I appreciate all of the comments here, both positive and less positive because I’ve gotten a better understanding of myself and others from this. Also, the yoga pants are quite comfortable and the Better Together tshirt is actually from Interfaith Youth Core, an organization that focuses on storytelling and engagement between different faiths. 🙂 I hope this explains everything a bit more, and I apologize for causing such confusion and uttering anything that hurt anyone. A few days later her original tormenter felt compelled to make an apology. “I felt the need to apologize to the Sikhs, Balpreet, and anyone else I offended when I posted that picture. Put simply it was stupid. Making fun of people is funny to some but incredibly degrading to the people you’re making fun of. It was an incredibly rude, judgmental, and ignorant thing to post.” He wrote. we r human being we should respect all ..not to based on someones status or fame. god bless u are one brave girl. Yes, I realize that my gender is often confused and I look different than most women. However, baptized Sikhs believe in the sacredness of this body – it is a gift that has been given to us by the Divine Being [which is genderless, actually] and, must keep it intact as a submission to the divine will. Just as a child doesn’t reject the gift of his/her parents, Sikhs do not reject the body that has been given to us. Great story and we need more women (and men) in the world like this. Also kuddos to the young man who apologized. what an inspiring post thanks for sharing.